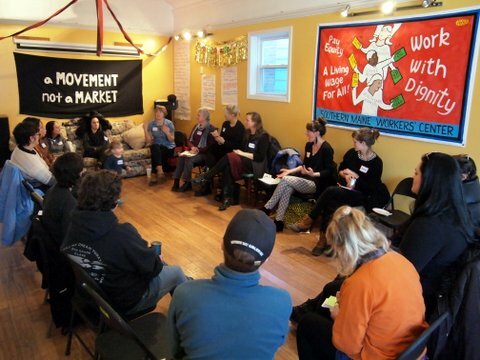 The Work With Dignity (WWD) Committee is the worker and workplace organizing wing of the Southern Maine Workers’ Center. We aim to help workers identify, create, and implement economic justice campaigns that represent their priorities. We do this work with a focus on fostering solidarity between immigrant workers, low-wage workers, union workers, and others. Building our knowledge and skills, we work to ensure that our legal rights and our human rights are met in the workplace. Campaigns: Southern Maine Workers’ Center members are advocating for a universal earned paid sick days ordinance in Portland, Maine. WORK Manual and WORKshops: We’ve developed a know-your-rights handbook and an accompanying training to help all Mainers to claim our right to a fair, respectful, and dignified workplace. Worker Support Hotline: If your rights have been violated by your employer or if you want to organize to improve the conditions in your workplace, we can provide resources and support.